Dry those tears, all few dozen of my loyal readers: I’m back! Recently, it’s come to my attention (because I, y’know, checked) that I have not posted any uplifting news about my glamorous existence since October of last year. Turns out that little baby Horizon has been invited to Minneapolis, as part of Theater Latté Da’s NEXT Festival. My collaborator Chip Klose (book) and I (music and lyrics) will be spending a couple of weeks in early May workshopping what we hath wrought (and making snow angels, probably) – culminating in three staged reading-type performances, complete with audience feedback and terror! It’s a crucial step in the piece’s development, and we are excited and gratified for the opportunity so soon out of the gate. Did I mention terror? Photo of his own typography: Chip Klose. This entry was posted in Blog, Music, Musicals, News and tagged blog, chip klose, horizon, michael holland, musicals, O'Neill, Theater Latté Da, workshop. Bookmark the permalink. Michael this is wonderful and so encouraging so quickly. I am jealous. Jane Caplow at Latte Da was very helpful in reading and advising on early versions of my show when she was with Davenport Theatrical. 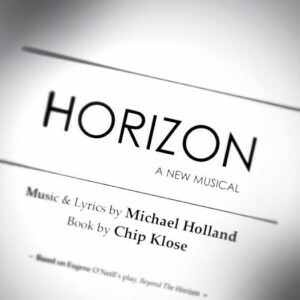 A new Michael Holland musical is a happy thing in the universe! When do we get to hear it?!?!?!?! ?